The Warriors look to take a 3-0 series lead against the Pelicans as the series shifts to New Orleans for the next two games. The Golden State Warriors took care of business at home in the first two games of the Western Conference quarterfinals against the New Orleans Pelicans. It wasn’t as easy as people thought it would be as the Warriors had the league’s best record at 67-15 in the regular season, including 39-2 at home. Game three is Thursday night in New Orleans. The upstart Pelicans look to get back in the series with a win or face an almost insurmountable 3-0 series lead. The Warriors won game one 106-99 despite leading by 25 with less than a minute to go in the third quarter. In game two Monday night, New Orleans took a 13 point lead in the first quarter and were up by 11 at the end of the period. Still, Golden State rallied to take a 3 point lead into halftime. In the second half, Golden State held New Orleans to 35 points. However, it was tied at the end of the third, and a two point game with just over 4 minutes to go in the fourth. The Warriors went on a 9-0 run at that point to take control of the game and held on for the 97-87 win. 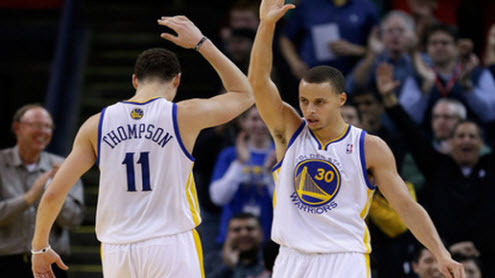 Klay Thompson had 26 points, 3 rebounds and 3 assists for the Warriors. Fellow Splash Brother Stephen Curry added 22 points, 6 assists and 4 rebounds. Draymond Green had 14 points, 12 rebounds, 5 assists and 3 steals. Leandro Barbosa scored 12 points off the bench Andrew Bogut had 14 rebounds and 3 blocks. Pelicans’ forward Anthony Davis had 26 points, 11 rebounds, 3 assists, 2 steals and 2 blocks. Eric Gordon had 23 points. Tyreke Evans added 16 points, 10 rebounds, and 7 assists per game. Norris Cole scored 11 off the bench for New Orleans. 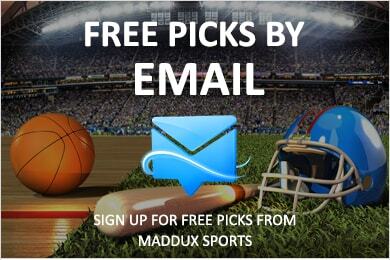 Check out our NBA odds page for the latest line moves in an instant. New Orleans, coached by Monty Williams, finished 5th in the Southwest Division, which became the second division to send all five of their teams to the playoffs in the same season joining the 2006 Central Division. The Pelicans tied with the Oklahoma City Thunder for the #8 seed. However, New Orleans won the head to head tiebreaker by winning 3 of the 4 contests against the Thunder in the regular season. The Pelicans are back in the playoffs for the first time since 2011. New Orleans is 47-37 ATS this season and the total is 42-41-1. The Pelicans were 13 point underdogs in game two and the total was 206.5. Golden State is coached by Steve Kerr. 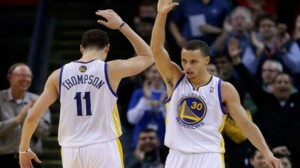 The Warriors won the Pacific Division by 11 games over the Los Angeles Clippers. It was the first division title for the Warriors since 1976. The Warriors are in the playoffs for the third straight season but few people thought they would make the leap to an elite team so soon. The Warriors are 47-36-1 ATS and the total is 39-44-1 this season. Golden State is outscoring teams 110-100 this season. The Warriors lead the league in scoring. Golden State is shooting 47.8% from the field and 39.8% from 3 point range. The Warriors are #1 in both categories in the league. Golden State is #9 in free throw shooting at 76.8% from the line. Opponents are shooting 42.8% from the field and 33.7% from 3 point range. The Warriors are #1 in field goal defense and #5 in three point defense. Golden State averages 44.7 rebounds per game and opponents average 44.5 per game. Golden State is #6 in rebounding but #24 in rebounds allowed. The Warriors average 27.4 assists, 14.1 turnovers, 9.3 steals and 6.1 blocks per game. Guard Stephen Curry averages 23.8 points, 4.3 rebounds, 7.7 assists, and 2 steals per game. He is locked in an epic battle with Houston’s James Harden for the MVP, but Curry is considered a slight favorite because the Warriors are a better team. Klay Thompson averages 21.7 points, 3.2 rebounds, 2.9 assists and 1.1 steals per game. Draymond Green averages 11.7 points, 8.2 rebounds, 3.7 assists, 1.6 steals and 1.3 blocks per game. He is probable with an ankle injury. Marreese Speights averages 10.4 points and 4.3 rebounds per game. Harrison Barnes averages 10.1 points, 5.5 rebounds and 1.4 assists per game. Other key players in the rotation include David Lee, Andre Igoudala, Leandro Barbosa, Andrew Bogut and Shaun Livingston. Lee is doubtful with a back injury. James Michael McAdoo is questionable with an illness. Parlay players can use our online parlay calculator to figure out what their winning wagers will pay. New Orleans is outscoring teams 99-98 this season. The Pelicans are shooting 45.6% from the field and 37% from 3 point range. New Orleans is in the top ten in both categories in the NBA. The Pelicans make 75.2% of their free throws. Opponents are shooting 45.5% from the field and 33.5% from 3 point range. New Orleans is #2 in three point defense but #21 in field goal defense. The Pelicans average 43.7 rebounds per game and opponents average 41.6 per game. New Orleans is #6 in rebounds allowed. The Pelicans average 22.1 assists, 12.7 turnovers, 6.7 steals and 6.2 blocks per game. Anthony Davis averages 24.2 points, 10.2 rebounds, 2.1 assists, 1.5 steals and 2.9 blocks per game. He is considered a dark horse for the MVP. Tyreke Evans averages 16.6 points, 5.3 rebounds, 6.5 assists and 1.2 steals per game. He is questionable with a knee injury. Jrue Holiday averages 14.8 points, 3.5 rebounds, 7.1 assists, and 1.6 steals per game. He is questionable with a leg injury. Ryan Anderson averages 13.9 points, and 4.9 rebounds per game. Eric Gordon averages 13.3 points, 2.6 rebounds and 3.8 assists per game. Norris Cole averages 10.2 points, 1.9 rebounds and 3.4 assists per game. Quincy Pondexter averages 9.2 points, 3 rebounds and 1.5 assists per game. Golden State is 7-2 ATS against teams with winning home records, 16-5 in first round games, 5-2 in road games, 37-18-2 on two days rest, 1-5 against teams with winning records, 0-4 after failing to cover, 0-6 after a straight up win, 0-5 overall, against Western Conference teams and against Southwest teams. The under is 8-2-1 ATS in this series recently including 4-1 in New Orleans. The Warriors are 7-2-1 ATS in their last 10 trips to New Orleans. New Orleans is 5-0 ATS at home, 4-0 against Pacific Division teams, 4-1 after a straight up loss, against teams with winning records and on two days rest, and 19-7 against teams with winning road records. The Pelicans are 4-1 ATS in the last 5 games against the Warriors and New Orleans was the underdog in each of those games. Golden State won both games at home but have yet to play a complete game in this series. I do think the Pelicans have shown they can play with the Warriors and it isn’t an impossible notion they could steal one of these two games at home in front of a raucous crowd. However, i think the Warriors find a way to win on the road.